"Cooking Demonstration by Charley Miller "
A black and white photograph showing Charley Miller's set-up for a cooking demonstration at the Danbury Fair in Danbury, Connecticut. No date. 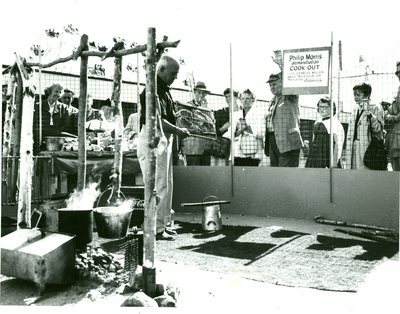 A sign in the background says, "Philip Morris demonstration Cook-out with Charley Miller, famous Maine Guide and America's top Outdoor Cook."